This is my fight song! Take back my life song. Prove I'm alright song! 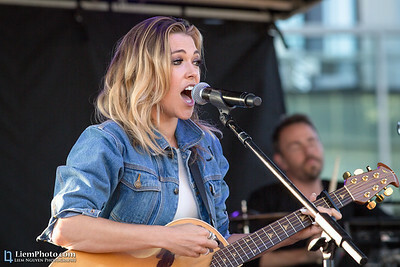 These well known lyrics are from an anthem song called "Fight Song" written and sung by the once up and coming, now quickly rising top 40's artist, Rachel Platten. Since last seeing Rachel back in March of this year, she continues to fight her way into new and existing fans around the world. This song and chorus can be heard almost anywhere you can think of: movies, television shows, political campaigns, commercials, movie trailers, radio stations, award shows, special events just to name a few, and it just doesn't stop there. She continues to get a lot of publicity and special performances to continue to get her name and music out to more people. Rachel is currently headlining in a worldwide tour around the world and around our nation that seems to never end to promote her latest album, Wildfire. 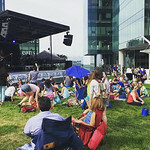 On top of her tour as well as performing and appearing at award shows and talk shows in between, this mega star musician is able to find the time to perform at a free show hosted by radio station Fresh 94.7 FM and Tysons Corner Shopping Center. 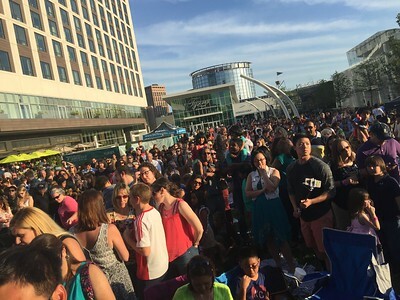 The lineup for this year's annual outdoor Summerfest on The Plaza concert was announced late May. 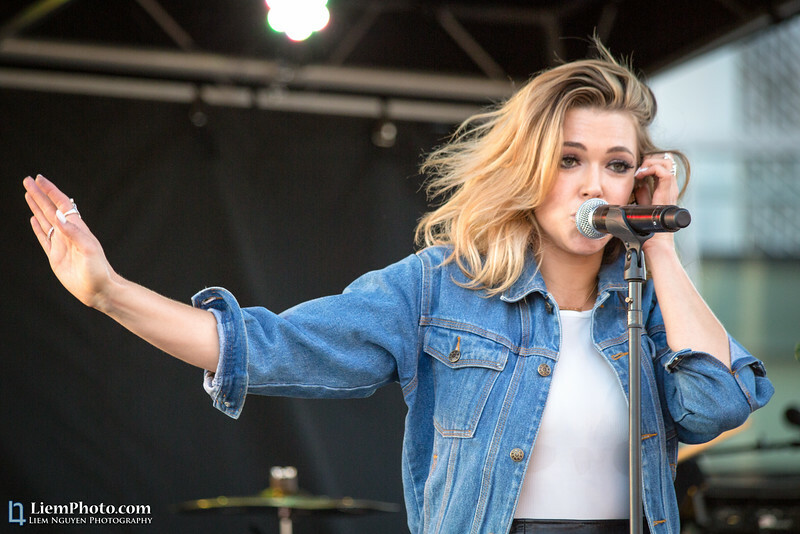 Upon analyzing who's performing through this summer, it is discovered that just two weeks from the lineup announcement, Rachel Platten would perform live, outdoor, and for free! It's not often that I get the chance to see a musician perform not once but twice let alone meet them twice in one year. Each show would be outdoors along The Plaza area of the mall and VIP meet and greet tickets would be available to win via contests or via purchase for $150. 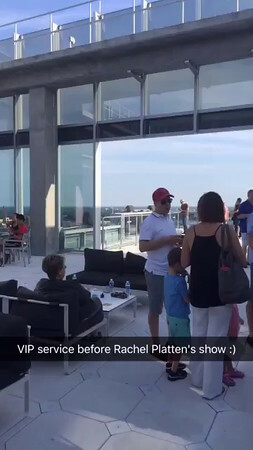 The VIP meet and greet tickets would include a chance to meet with Rachel as well as a inclusive reception before the show with drinks and food in the penthouse level of the Tysons Tower building. 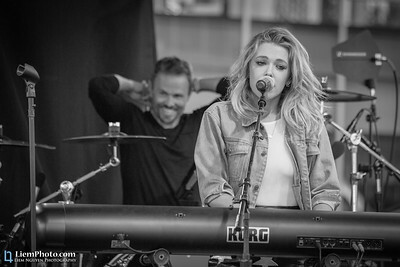 Hearing that Rachel Platten is coming back not to just the Washington DC area, but to Northern Virginia was a joy to hear since I work just 5 minutes away from the mall. The last time I saw Rachel twice in one year was back in 2012 which was before her "Fight Song" fame, so to see her twice in one year after the "Fight Song" fame is just amazing. 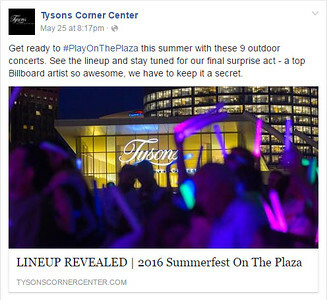 Also, last time I've gone to these free shows at Tysons Corner and sponsored by Fresh 94.7 FM was two years ago when I saw Lindsey Stirling perform for the first time as well as meet her for the first time after winning a Twitter contest hosted by Tysons Corner. You can check out the pictures I took from that show by clicking here, and see the video clips from the show by clicking here. Seeing this time was another opportunity to win a chance to meet Rachel for free was another reason to get me determined to win. By winning, it would a good amount of money saved to use another time. The contest this time around was an Instagram contest that was announced first thing Monday, the same week Rachel performs later on Friday. This contest was a bit more time consuming since with Lindsey's contest was basically a tweet to @shoptysons to win meet and greet with Lindsey. During the same time as his contest was going on, Fresh 94.7 was also doing daily contests that whole week. My thought was that the radio station would be harder since more people follow, listen, and call in, so I decided to focus on the contest the mall had with Instagram. The contest that Tysons had was to post a picture or video of yourself jamming to one of Rachel's songs and the top 5 liked posts would be the winners. I didn't have time on Monday since I was at work all day then went straight to play badminton that same evening, so it gave me time to think of how I want to post a video on Instagram to enter the contest. On Tuesday as soon as I got home from work, I figured out what I wanted to do. I pulled out my camcorder and tripod since it would have been difficult for me to hold the phone while doing the video. For the background song to jam to, I decided to pick "Stand By You" because I have always believed there was something special with Rachel since I first saw her perform at Jammin Java back in 2010, and I have always stood by her every since. What I decided to do was display all my meet and greet pictures with Rachel and the dates when I met Rachel underneath each pictures. The last picture would be a question mark and the date June 10th, questioning everyone if I can meet her again that day. To view that video post, you can click on the screenshot. After posting the video on Instagram, I was determined and worried at the same time that my friends would get annoyed with me for asking their help or even just not helping me at all to like one video post. I'm not the type of person that does contests like this nor even ask for favors frequently, so when I ask my friends, I would hoping they are willing to help. One thing I definitely avoided doing as much as possible is mass contacting friends as I didn't think that would be productive and it would just be spamming. I personally contacted people via text, messaging, email, chat a friend or a few friends at a time asking for their help. The overwhelming of friend willing to help was astonishing! My initial attempt to get in the top 5 made it to #3 which was great. As the week went on, a few more contestants entered the contest that were probably in high school or in college. They used their connections and popularity to boost their likes. At one point, I was pushed down to #5 and worried one more contestant that enters could push me out of the race. This was when I tried to contact people that I may not have talked to in years also for their help. I even went as far as to create a spreadsheet in Google Documents to keep track of all the contestants and number of likes to determine how much involved I need to get for people to like my post. The contest finally ended around noon on Friday (same day as the concert) and by my account, I should be winning at #4 spot for most liked posts. 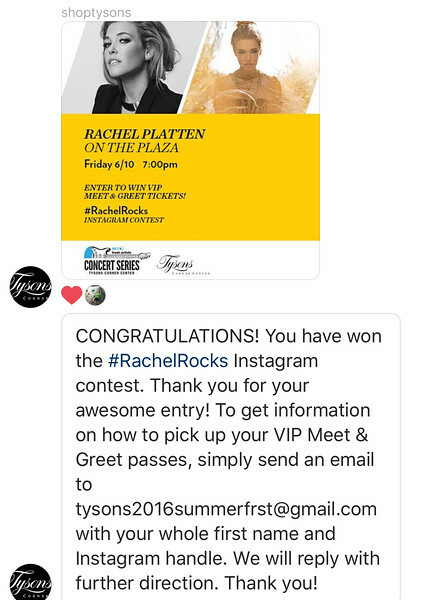 Not soon after the contest ended, I finally got a direct message from @shoptysons to confirm what I already knew that I was one of five contestants that won! It was a pretty tight race in the last few days, but it was all thanks to everyone who helped me to win! Every single like counted after all! There are a few individuals that went above and beyond to help me by giving me additional likes and you know who you are; thank you so much! Even Marie Digby helped like my post. That's pretty amazing! Each contestant that won was able to bring one additional guest of their choosing to the pre-show reception and to the meet and greet. I asked if one of my friends if she wanted to be my guest since I already invited her, her husband who also works with me, and their two daughters to come watch the free show with me; plus, she was supposed to go with me to watch Rachel back in March, but she had working schedule conflicts. My friend and I, both head over to The Plaza at Tysons after work around 4:30 pm since we carpooled that morning. We meet up with his wife and daughters in the mall parking garage before finding our sitting area at The Plaza. Once we settle in, we head over to the Fresh 94.7 tent to pick up our VIP wristbands. I, then, asked if my friend's daughters can come along too since my friend is my guest for the VIP ticket. Luckily, they didn't have any problems with it since both her daughters were under the age of five. The Fresh 94.7 representative said that the pre-show reception at the penthouse level of Tysons Towers starts at 5:30 pm and directs us where we should go once it starts. At this point, I was thrilled that things are coming along smoothly as I wanted them to. Prior to heading up for the VIP reception, my friends get dinner for their daughters. Short after, I went back to the Fresh 94.7 tent to confirm where the reception is at. Once arriving at the tent, I noticed that they were passing out free selfie sticks for the show. I never had a selfie stick before, so I grabbed a few: one for me and one for my friend. At that moment, I understood what Tysons meant by saying "selfies sticks not judged, but rather encouraged". This is probably the first event I've been to where selfie sticks are a blessing. My friend and her daughters, and I then start heading up to the penthouse level for the reception. The penthouse level was a pretty nice setting. 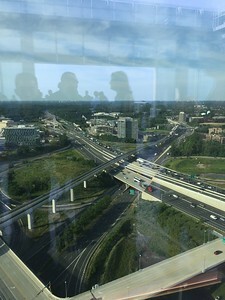 You get a great 360 view of the Tysons area and beltway from one of the tallest buildings in that area. 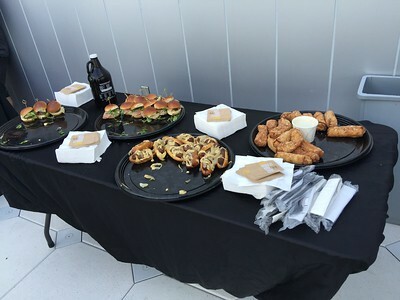 We are greeted with chicken and hamburger sliders, hot dogs, burritos, sodas, and wine. We sit and chill to eat there for about an hour. It was a good thing I didn't buy any dinner yet. I didn't expect to have food at the reception. About half an hour before the show starts, we all head back down to The Plaza lawn to settle in. By now, a lot more people have arrived and nearly covered The Plaza. What got annoying is how all the high school girls with no good manners decided to run over everyone's picnic blanket and over little kids to stand in the front near the stage. I thought it was so rude considering it is a family friendly environment that ended up having about two to three dozen high school girls standing in front of families of people with kids sitting down who got there few hours earlier in advance. Luckily, these girls didn't ruin my video recording of the show nor me taking pictures of Rachel during the show or block the view of the show. Nevertheless, my friends and I try to not let that ruin our evening. We decide to unfortunately stand up too and my friends have their daughters on their shoulders or carry them in their arms. It is now 7 pm, but Rachel has not taken the stage yet. Looks like the show is starting a little bit late. The deejays/hosts from Fresh 94.7 comes on stage to open the show to get everyone excited and to giveaway a few shirts. Rachel finally comes out on stage with her band around 7:20 pm, and the crowd goes wild. Rachel comes out with her smiling and happy self as I know her. She wears a summer like outfit for a fitting outdoor show, and mind me saying that luckily that evening was not an extremely hot one. The show is supposed to be only about 45 minutes, so I didn't expect her to perform most of her songs from her latest album, "Wildfire". The only songs she left out was actually just "Astronauts" and "Superman"; unfortunately, those are actually a few of my favorite tracks off the album. 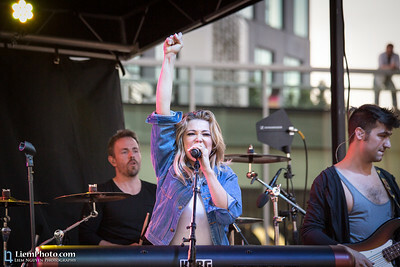 She also performed her Target exclusive bonus track "Lonely Planet". Rachel also couldn't leave out having fun covering a few songs. The songs she covered was "Love Yourself" by Justin Bieber and during her encore "Don't You Worry Child" by Swedish House Mafia. She also ended the show and her encore with her acclaimed and anthem single "Fight Song". The song that rocketed her career. Rachel basically covered everything she could on stage. She had the full band performances; stripped down acoustic performances; sung covers; perform originals. To see her performances in its entirety, you can click on the embedded video below and see her set list for the show to view them individually. My apologies in advance for the poor audio. I didn't have my external mic, so the bass killed the audio. Rachel definitely put on a great show considering it's a free one out of her busy schedule. She performed a total of 14 songs and I'm pretty sure it lasted well longer than 45 minutes. I lost track of time since I was having a good time. Some of the memorable moments from the show was during her "Stand by You" performance, Rachel walked off stage to the back of The Plaza while singing to high five and handshake fans watching from the back. That was definitely something of a surprise. What a class act! So down to Earth to allow fans in the back to have some memorable moments. As expected with the free selfie sticks given out for free, a lot of people took advantage of this to take some great selfies or to take some pictures/videos elevated above everyone. At most shows, I would not been annoyed with this, but it was kind of cool seeing people, friends and family, taking group pictures with their new selfie sticks. Lastly, many fans not truly understand or believe when Rachel explains why and how she came up with and wrote the "Fight Song". Every time I hear her explain the meaning of that song to the crowd, she meant every word; honest to every word spoken. That song was a true fight back from seeing her career stand still and not progressing. Her rise to fame that no one saw coming: her band, her management, her drummer Craig, and not even Rachel, herself. Knowing Rachel before her fame, just made each live show I see her perform so much more grateful and so much more honored to have the opportunity to see her career blossom. She ended her show saying how lucky, how much she loves the DC metro area for being with her even before her fame, and how much this region means to her. I was also able to take so many fabulous pictures of Rachel and her band during this show. Please check them out by clicking on the links below the slideshow. Fresh 94.7 also took pictures from the show and event too. You can see them by clicking here. At the end of the show, my friend with her daughters and I met up back at the Fresh 94.7 tent to prepare to do the meet and greet. I wish that the meet and greet was before the show like when I went to see Lindsey Stirling. At this point, we all just wanted to home. The radio station representatives finally grouped everyone up and we head into the Hyatt hotel into a private area for the meet and greet. I gather my friend and her daughters. Her daughters were so excited to meet the person who sang the "Fight Song". We finally line up and wait for Rachel to enter the room. It was probably a half an hour wait. I let my friend and her daughters go first. At first sight, Rachel loved my friend's daughters. The older daughter told Rachel that she listens to her "Fight Song" on the radio all the time. So awed by what the older daughter said, Rachel asked her to repeat again to her drummer/tour manager, Craig, who was standing not far from her. Rachel carries the older daughter up while my friend carries her younger daughter for the picture. Next up is me. She, of course, remembers me and refers me by name and says "Oh Liem, it's so good to see you again and thanks for coming to support me!" I give her a few hugs in response. Unfortunately, for the second time, the meet and greet representatives wouldn't allow any autographs, which is disappointing, but it was okay. I was able to get my fifth picture with Rachel--three before and two after her fame. Although, to this date, I still have an unsigned "Wildfire" album. As we leave the premises of the meet and greet, the younger daughter said she didn't get to say hi to Rachel, so I told my friend to try to go back in. People can't deny them entrance again for two little kids, which I was right. This time, the younger daughter got to hold Rachel's hand but, of course, the older daughter, took the spotlight again! In conclusion, everything about this evening went close to as planned and as smooth as I can ever hope for. I got to get some great pictures of Rachel; I was able to capture the show on video even though the audio isn't so great; and I got to meet Rachel once again. As for both of my friend's daughters probably had a night to remember. 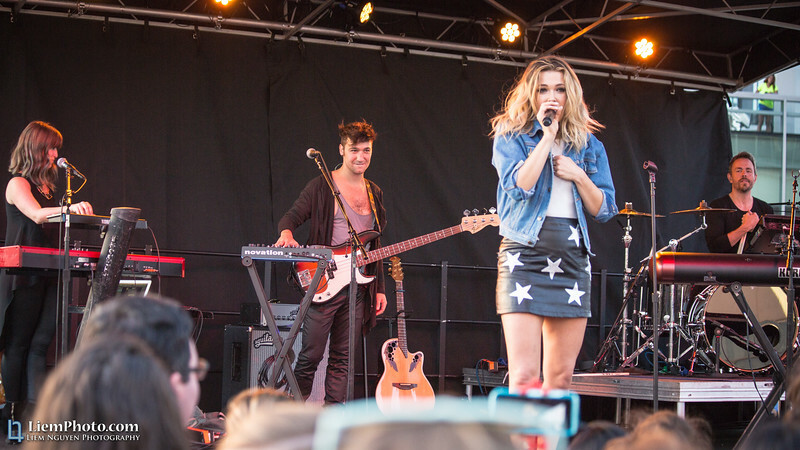 They couldn't stop talking about meeting Rachel Platten. Be sure to go out and listen to and go watch Rachel live because she's such a great singer, performer, entertainer, and just all around a great down to Earth human being. She has not changed since I first met her!